UK politics at the moment is characterised by a series of hostage situations and bad ideas. Depending on who you listen to, the Labour Party is either being held hostage by the UK’s thousands of communist sleeper cells or by Tories who got lost on the way Conservative Party Conference somewhere around 2007. The truth, like the issue of who actually gets to vote in the leadership contest or how Labour MPs will perform the vital task of Her Majesty’s Opposition in the aftermath of Labour’s bizarre and bitter leadership contest, is more nuanced and complicated. But Labour’s travails are really only a sideshow to the real drama: Brexit. The referendum was the easy part. Now Prime Minister Theresa May is tasked with implementing something that is proving a legal and political nightmare. Recent events throw the situation into stark relief; at the G20, the US and Japan made it clear that the UK’s strength lies in its role as a gateway to the EU’s single market. At home, the Cabinet Brexit brainstorm away day looked like every awkward corporate away day you’ve ever been on, including the bad ideas “Let’s reclaim that buccaneering Victorian spirit!” (the rest of the world has fond memories of Empire, right?) and awkwardness. They also concluded that Britain should get a “unique” deal – so Project Snowflake is go. Prime Minister Theresa May’s smile is starting to crack as she keeps repeating that “Brexit (still) means Brexit”, trying to keep impatient Brexiteers happy as their selective amnesia determines which of the wild promises made during the referendum campaign they care to make someone else implement. Like a ransom note made of magazine cuttings, the pieces will make the whole, but we cannot let the government off the hook for day-to-day governance. So, while a points-based immigration system for all was ruled out on Monday, not much was said about the other big broken Brexit promise: extra cash for the NHS. But this is beyond Brexit. Theresa May chose to keep Jeremy Hunt on at the Ministry of Health despite his mismanagement of the junior doctors’ contract negotiations. 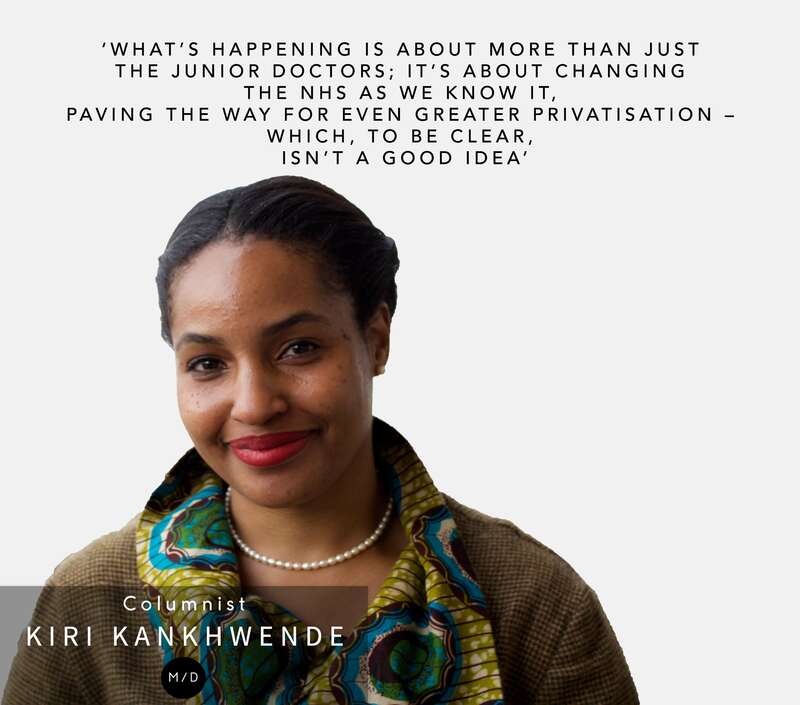 That’s because what’s happening is about more than just the junior doctors; it’s about changing the NHS as we know it, paving the way for even greater privatisation – which, to be clear, isn’t a good idea. Under the Tory government, we have witnessed the first all-out strike in the NHS’ history, with further monthly actions planned. The doctors are being vilified in sections of the press as greedy but they insist that this is about patient safety in an underfunded system which is creaking at the seams. Next week’s action has been suspended but the stakes remain high – for all us who care about universal healthcare. It’s not surprising that the breaking of the immigration promise caused such consternation; campaigners rode the tiger of xenophobia and racism to get them over the line. The subsequent wave of post-referendum racist attacks shocked many, but racism in the UK is still structural and deeply entrenched, as a UN report reminded us in August. Its recommendations spanned areas such as health, education, employment and criminal justice, but the investigating committee also criticised the role of politicians in fuelling hate crimes during the referendum campaign by emboldening those with prejudiced views. The murder of Polish immigrant Arkadiusz Jóźwik in Harlow is under investigation, so it would be unwise to draw premature conclusions, but it cannot be denied that it took place in a particular context. His brother has spoken out about the hostility felt by eastern Europeans in the town and white immigrants from Eastern Europe are increasingly racialised in anti-immigration discourse. Although the aftermath of the referendum threw a spotlight on this and other more blatant forms of racism, this also pre-dates the referendum campaign. We have to take the long view with our solutions too. The UN report came hot on the heels of the Equality and Human Rights Commissions report, in response to which May announced a government audit of racial discrimination in the public sector. Migrant Rights makes a compelling argument for including anti-migrant xenophobia in this because, as with the lingering nature of racial discrimination, the effects of today’s xeno-racism could have ramifications for generations to come. The audit is important, but the truth is that all of this research has been piling up for years. Those affected don’t need to be told. But we do need meaningful changes to start being made to address it. The timing of activating Article 50, which kickstarts the process to leave the EU, remains unclear – though we’re told it won’t be before the end of this year. We haven’t even begun to fill all the posts in the gargantuan – and expensive – bureaucratic unit that will be set up to manage it. The timing will probably be done for political reasons and we’ll make it work but it’s going to be hard. The question of who should shoulder that burden is the one we should be asking now. White Men Dancing is a weekly column. Kiri Kankhwende and Maurice Mcleod keep an eye on Westminster. Politics is too important to leave to politicians.